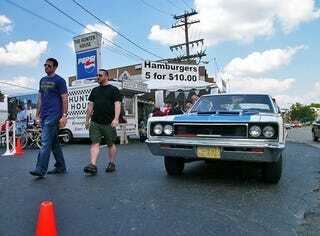 This weekend's Woodward Dream Cruise is a highlight of the Detroit calendar. It's a time to show off your classic ride to people who know and care about car culture. What would you drive to the Woodward Dream Cruise? The great thing about Woodward is it's fairly autopluralistic and allows everything from old Army trucks to DeLoreans. But at the end of the day it's about the classics, so the only restriction we're putting on this is to select a car at least 25 years old. And since this is such a personal question we've polled the Jalopnik staff. The big boss man Ray Wert selected a black 1973 Corvette Stingray Coupe, which demonstrates both his cool retro attitude and penchant for redneck nostalgia cars. New guy and George Romney aficionado Justin Hyde picked a 1973 AMX Javelin in red/white/blue because "It's an American muscle car that's not been trammeled by the rush to retro; it's an underdog, and it's a great example of what Detroit could do under pressure." Seriously, two cars from 1973? Gentle Ben Wojdyla was torn between a classic Messerschmidt microcar and a vintage motorcycle, because he likes to be able to cruise in-and-out of traffic. Matt Hardigree, referring to himself in the third person, is going classic with a 1959 Ford Skyliner. It's not only a gorgeous American car from an era when the United States was on top of the globe, it's also the first production car with a retractable hardtop. You know, for when he has to hide from his adoring fans. Woodward approaches! Select your chariot.